Worm gears operate as set, which consists of a worm gear wheel and a worm shaft. They are usually used when the ratio of the speed of the driving member to the speed of the driven member is large, and for a compact right-angle drive. 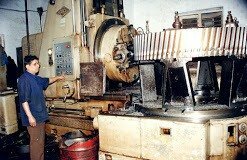 They can provide a high level of mechanical indexing accuracy, as needed on for instance machine tools. But this also means they seldom operate at high efficiency levels. A Worm Gear is used when a high velocity attrition rate is required between bridged axis shafts which do not cross at a point. Basic Worm Gear can be used but the energy which can be passed on is low. A Worm Gear Manufacturing includes a huge size worm rim with a worm attach meshing with teeth on the outside of the worm rim. The Worm Gear is just like a twined and the worm rim is just like an area of a nut. As the worm is turned the worm wheel is triggered to move due to the twined like activity of the worm. The dimension of the Worm Gear set is usually based on the center range between the worm and the worm wheel. As A Worm Gear Manufacturer We manufacture the following Types of Worm Gears. As with most of our gear products, our background in producing worm and worm gear sets puts us one more step ahead. 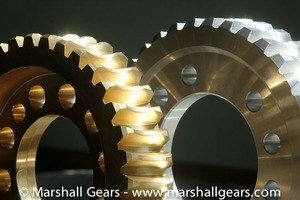 We can produce worm gears up to 3550 mm in diameter, and up to 4 starts. We manufacture worm gears from all types of materials, bronze, stainless steels, ductile irons, cast irons and alloy steels, for all types of applications. Another way that we're able to make the highest quality worm and worm gear sets is the testing we're able to do. This allows us to match the tooth bearing contact exactly, and verify backlash to specified requirements. This is another example of how we're able to control quality, meeting or exceeding our customers’ requirements. Worm gears cap sate provide a normal single reduction range of 5:1 to 100-1 and can go easily up to 127:1 or more under rare circumstances. The pitch line velocity is ideally up to 30 m/s. The efficiency of a worm gear ranges from 98% for the lowest ratios to 20% for the highest ratios.